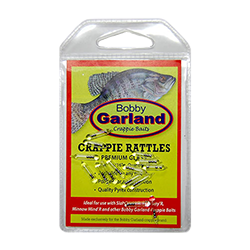 Demand attention from crappie with these tiny but loud miniature rattles designed exclusively for Bobby Garland Crappie Baits to fit small soft-plastic crappie jigs. Easy to insert. Made in USA. 15 Count.